The fourth Princeton was laid down as Tallahassee (CL-61) by the NewYork Shipbuilding Corp., Camden, N.J., 2 June 1941; reclassified CV-23 on 16 February 1942; renamed Princeton 31 March 1942; launched 18 October 1942,sponsored by Mrs. Harold Dodds, and commissioned at Philadelphia 25 February1943, Capt. George R. Henderson in command. Following shakedown in the Caribbean, and reclassification to CVL-23on 15 July 1943, Princeton, with Air Group 23 embarked, got underway forthe Pacific. Arriving at Pearl Harbor 9 August, she sortied with TF 11 onthe 25th and headed for Baker Island. There she served as flagship, TG 11.2and provided air cover during the occupation of the island and the constructionof an airfield there, 1-14 September. During that time her planes downedJapanese "Emily" reconnaissance planes and, more important, furnishedthe fleet with photographs of them. Completing that mission, Princeton rendezvoused with TF 15, conductedstrikes against enemy installations on Makin and Tarawa, then headed backto Pearl Harbor. In mid October she sailed for Espiritu Santo whore shejoined TF 38 on the 20th. With that force she sent her planes against airfieldsat Buka and Bonis on Bougainville (1-2 November) to diminish Japanese aerialresistance during the landings at Empress Augusta Bay. On the 5th and 11thher planes raided Rabaul and on the 19th, with TF 50, helped neutralizethe airfield at Nauru. Princeton then steamed northeast, covered the garrisongroups enroute to Makin and Tarawa, and after exchanging operational aircraftfor damaged planes from other carriers got underway for Pearl Harbor and the west coast. Availability at Bremerton followed and on 3 January 1944 Princeton steamedwest. At Pearl Harbor she rejoined the fast carriers of TF 50, now designatedTF 58. On the 19th she sortied with TG 58.4 for strikes at Wotje and Taroa(29-31 January) to support amphibious operations against Kwajalein and Majuro.Her planes photographed the next assault target, Eniwetok, 2 February andon the 3rd returned on a more destructive assignment-the demolition of theairfield on Engebi. For 3 days the atoll was bombed and strafed. On the7th Princeton retired to Kwajalein only to return to Eniwetok on the 10th-13thand 16th-28th, when her planes softened the beaches for the invasion force,then provided air cover during the assault and ensuing fight. From Eniwetok Princeton retired to Majuro, thence to Espiritu Santo forreplenishment. On 23 March she got underway for strikes against enemy installationand shipping in the Carolines. After striking the Palaus, Wolesi and Yapthe force replenished at Majuro and sortied again 13 April. Steaming to New Guinea, the carriers provided air cover for the Hollandia operation(21-29 April), then crossed back over the International Date Line to raidTruk (29-30 April) and Ponape (1 May). On 11 May Princeton returned to Pearl Harbor only to depart again onthe 29th for Majuro. There she rejoined the fast carriers and pointed her bow toward the Marianas to support the assault on Saipan. From 11-18 Juneshe sent her planes against targets on Guam, Rota, Tinian, Pagan, and Saipan,then steamed west to intercept a Japanese fleet reported to be enroute fromthe Philippines to the Marianas. In the ensuing Battle of the PhilippineSea, Princeton's planes contributed 30 kills and her guns another 3, plus1 assist, to the devastating toll inflicted on Japan's naval air arm. Returning to the Marianas, Princeton again struck Pagan, Rota and Guam,then replenished at Eniwetok. On 14 July she got underway again as the fastcarriers returned their squadrons to the Marianas to furnish air cover forthe assault and occupation of Guam and Tinian. On 2 August the force returnedto Eniwetok, replenished, then sailed for the Philippines. Enroute its planesraided the Palaus, then on 9-10 September struck airfields on northern Mindanao.On the 11th they pounded the VisaYas. 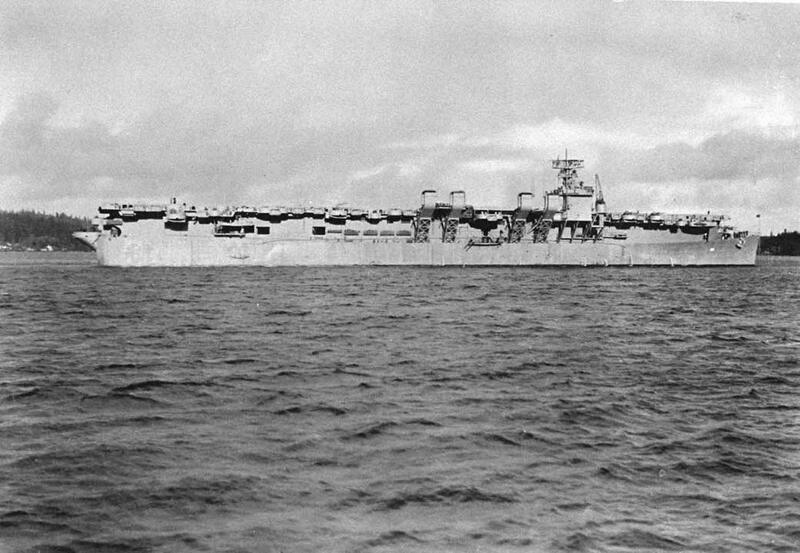 At mid-month the force moved backover the Pacific chessboard to support the Palau offensive, then returnedto the Philippines to hit Luzon, concentrating on Clark and Nichols fields.The force then retired to Ulithi and in early October bombed and strafed enemy airfields, installations and shipping in the Nansei Shoto and Formosaarea in preparation for the invasion of the Philippines. On the 20th, landings were made at Dulag and San Pedro Bay, Leyte. Princeton,in TG 38.3, cruised off Luzon and sent her planes against airfields there to prevent Japanese land based aircraft attacks on Allied ships massed inLeyte Gulf. On the 24th however enemy planes from Clark and Nichols fieldsfound TG 38.3 and reciprocated. Shortly before 1000 a lone enemy dive-bombercame out of the clouds above Princeton. At 1500 feet the pilot releasedhis bomb. It hit between the elevators, crashed through" the flightdeck and hanger, then exploded. Initial fires soon expanded as further explosions sent black smoke rolling off the flight deck and red flames along the sides from the island to the stern. Covering vessels provided rescue and fire-fighting assistance and shielded the stricken carrier from further attack. At 1524 another much heavier explosion, possibly the bomb magazine blew off the carrier's stern and with it the after flight deck. Birmingham, alongsideto fight fires, suffered heavy damage and casualties. Efforts to save Princeton continued, but at 1604 the fires won. Boatswere requested to take off remaining personnel and shortly after 1706 Irwinbegan to fire torpedoes at the burning hulk. At 1746 Reno relieved Irwinand at 1749 the last, and biggest, explosion ocoured. Flames and debrisshot up 1000-2000 feet. Princeton's forward section was gone. Her after section appeared momentarily through the smoke. By 1750 she had disappeared, but1,361 of her crew suryived. Ineluded in that number was Capt. John M. Hoskins,who had been prospective commanding officer of CVL-23 and lost his rightfoot with her, but who, despite the loss, would become the 1st commandingofficer of the fifth Princeton (CV-37). Losses and damage to assisting vessels were heavy: Birmingham-85 killed300 wounded, a heavily damaged topside, and loss of 2 5", 2 0mm. and2 20mm. guns, -foremast lost, portside smashed; Irwin-forward 5" mountsand director out, starboardside smashed; and 40mm. smashed.